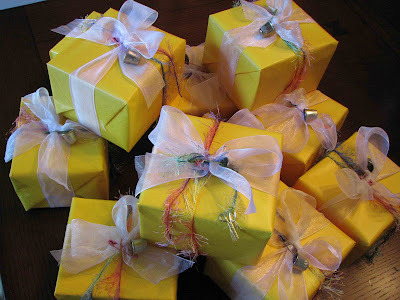 I promised to post a photo of my little packages all wrapped up, and here they are. We've been working on my dollhouse around here lately. Have a look here. How lovely your packages look--I look forward to Amy sending our big package and will hope that yours is one that I receive. If not, well...then I guess I'll figure out a way to make one for myself and shall count your fabulous idea as a blessing.